We are on the final leg to Alaska! With a leap of faith we left Kentucky on August 1, 2009 with $300 in our pockets. 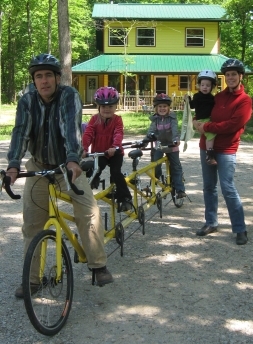 It is our goal to ride our five person tandem bicycle across the country to Alaska. Dad, Mom, and daughters Cheyenne, Jasmine and Robin, then ages six, four and two. We set out to prove that it is possible for a blue collar worker and a stay-at-home mom to live their dream. A dream to show our girls this great country we live in. A country filled with wonderful people. People that live a life of love, a life of sharing, a life of giving. We are honored to say that we have been the recipients over and over again of this warm love. We have been offered places to stay, hot meals, a heartfelt cheer and also cash to fund our needs on the road. You are one of many that have touched our lives. One of many that we have had a chance to touch. You are part of the reason why we are able to do what we are doing. To bring joy and laughter, to bring hope, inspiration and encouragement. Thank you for being a part of our journey. Thank you for letting us be a part of your journey. In this life we can only live life to the fullest. Take action upon your dreams. Love, live, be kind. Let us continue the journey together. In tangibles it will lead us to Alaska. In spirit it can lead us anywhere. The first family to pedal 7,000 miles on a quint bicycle from Kentucky to Alaska across the North American Continent. about nature, people and the United States.